In solidarity with its Cape Town counterparts, Aquila Private Game Reserve and Spa has taken the current water crisis extremely seriously. While the Breede valley municipal region has not been flagged as a water crisis zone, the Karoo-based big five safari destination in Touws River has, since its inception, treated the commodity with respect and with principles of sustainability. Aquila is the internationally recognised Imvelo award winner for sustainable tourism measures implemented by a large tourism establishment – and these measures include water and energy management. Aquila also happens to be located in one of the Succulent Karoo Ecosystem Programme’s (SKEP) eight geographical priority areas: the Central Breede Valley. The game industry is growing by leaps and bounds, particularly in the Southern Cape parts of the Succulent Karoo. If managed well, this can be another potential growth point for nature-based tourism in the Succulent Karoo. Clear messaging on all confirmed bookings prior to arrival to ensure guests use water sparingly during their Aquila visit. The installation of in-room ‘water crisis’ notifications to give guests tips on how to use less water during their stay. Clear notices requesting use of a two-minute shower. Communal areas make use of non-potable water (only when absolutely needed). Visible key messaging placed at communal areas to make visitors aware of the water usage policies. All communal gardens have been changed to remove any vegetation requiring excessive water, and succulents, which occur naturally in the Karoo, have been used throughout the property. Further measures to reduce bulk water consumption are currently being investigated. Aquila recently had to do mandatory repairs and maintenance to the swimming pool and made use of innovative water bladders to not waste a single drop of water. The entire 35 m pool was emptied into large water bladders, and after repairs refilled with the same water. Karoo water supply management and infrastructure are complicated and fragile. Aquila uses a mix of municipal supplied potable water, its own limited supply groundwater, rainwater, and non-potable water. The municipal boundaries of the Cape Town crisis management zone do not apply to the Touws River region and Aquila. In 2008, SKEP commissioned a study on the ecosystem services of the Succulent Karoo. The study highlighted that tourism is quite a complex ecosystem service that depends on a number of natural and human features. Overall, the report disaggregated tourism into two components: flower viewing tourism and general scenic tourism. An outstanding landscape such as the Succulent Karoo lures tourists country and world-wide. 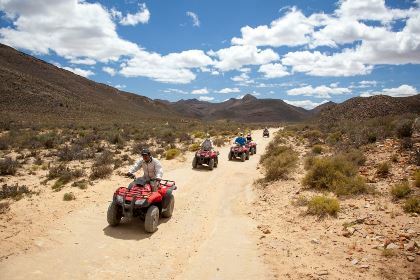 Tourism is promoted as a growth area for the Succulent Karoo and is supported through some local and provincial government initiatives.